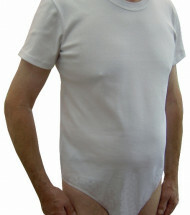 100% cotton jersey interlock all-in-one ladies and gents vests which open at the crotch. Designed for a gent who was a wheelchair user and wanted an all-in-one T Shirt style vest, secured at the crotch to keep incontinence underwear in place, and to keep his back warm. It was requested for the vest to have a generous gusset in order to cover the front of his incontinence pads. The Ph..